Since Leuven was just half an hour from Brussels, we decided to just start early and get back by night, than trying to find an accommodation in Leuven! As I mentioned in my earlier post, my first stop was Groot Begijnhof, as it was open 24 hrs and farthest from the town centre (well, from one of the end of the town to another its just a 30 mins walk!). From there we strolled down to the town centre and on the way were some very interesting sculptures including Renee by Armand Loveniers (a studious gal near St.Michael’s church) and Fons Sapientiae by Jef Claerhout (holding a book and pouring knowledge (beer?) on his head)!!! As we reached the town centre, there atop the South Façade of St.Peter’s church was Meester Jan, the golden fellow, who bangs on the bell every hour! The original one was from 1381, but was replaced multiple times till 1573 CE. Here in the Grote Markt is the tourist office where the ILuvLeuven combi ticket can be bought and we headed first to M Museum Leuven and out of there I headed to St.Peter’s Church & Treasury. In this area is another sculpture – Dorre de Bekker! This is a sculpture of a young man carrying a tray of bread dough to be baked. Ages ago, this locality had a tradition of baking craft! This was made by Roland Rens in 1979. From here we walked to University Library Tower. What’s the best way to see Leuven? No, not to explore Leuven, but to just ‘see’ Leuven. Get atop some very tall structure! The tallest structure here is the tower of University Library. The viewing platform is 5 stories atop the library and a spiral staircase takes you there! As you can see from outside, till the clock face, it’s a relatively broad structure like Big Ben. This is what is split in 4 floors and the 5th floor being the clock room. The rooms are large enough and have a display in each of them with a couple of chairs. The last bit after the clock to the viewing platform is a small continuous spiral without break. How hard is it? It isn’t as complicated as Basel or as tall as Copenhagen. Well, in my 7th month of pregnancy, I managed with a small pause in each floor. Totally worth it and the view from atop is stunning and being a small town, has a very different landscape than the other cities which I’ve seen from atop! The very depressing history associated with this University library was that it was completely burnt down during the World War in 1914 and 3 lakh books have been lost forever! The current structure was built with the help of American funds and the same has been inscribed on the bell atop! There are 2 other important sculptures – Balloon of Friendship and Totem near this University Library! The Balloon of Friendship was made by Danny Tulkens in 1987. This originally had 4 people in it of which one has been stolen! In front of the Library is the Totem – a giant 23m tall needle with a jewel beetle pinned on it! This was made by Jan Fabre. From here, we parted ways as the preggers me decided to skip a tour of Stella Artois Brewery and explore more of Leuven and headed to Sint Donatuspark. What attracted me the most to this park was that it encompasses ruins of the original 12th C city walls and towers! My next stop was St.Michael’s Church for 10 mins before heading to the Town Hall. At the same time my guy was at the Stella Artois Brewery. 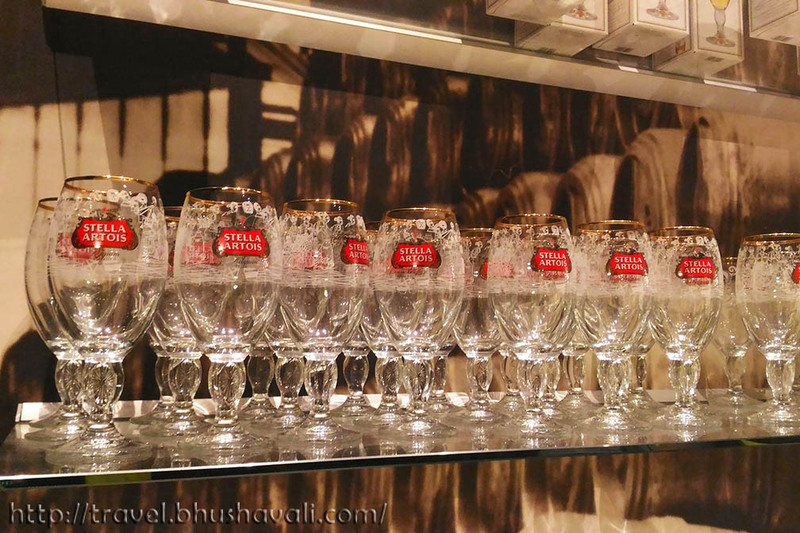 The origins of Stella Artois brewery began in 1366 with De Hoorn Brewery which Sebastian Artois took over in 1708. In those times, without climate control transport, it was not possible to sell the beer out of Belgium as it got spoilt in 2 days. It was he who started using hops instead of spices to make the beer long lasting! Raw material comes in from Czech & UK. Earlier it was the canal beside it that was used for transport of goods. 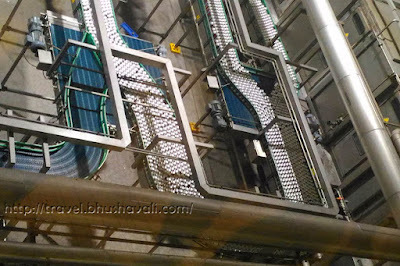 Ground water is used for beer manufacture in this plant. Earlier the requirement was 10 bottles of water to manufacture 1 bottle of beer (10:1), but now with increased sensitivity and tecnology, water is being recycled & reused, bring down the ratio to 3:1! This was called Stella Artois since 1926 when their special edition of clear Christmas beer called ‘Stella’ (named after the Latin term for ‘star’) became a super hit! Presently ABinBev has brought several beer manufacturing units in Belgium incl Stella Artois, Jupiler, HoeGaarden etc. Well, Stella Artois / Hoegaarden beer as it is, wins hands down compared to Heineken (that's our personal preference!). 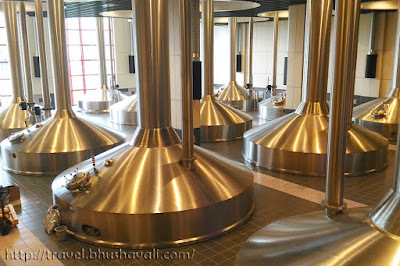 However this brewery experience, was a let down, when compared to Heineken Experience! Though it was a 2 hr visit, most of it was spent in showing a video of the history and process of bottling! The factory visit was only the bottling section visit! However finally the 2 glasses of beer tasting & a goodie bag of a bottle each of Hoegaarden, Jupiler and their premium brand Leffe, completely made his day! In front of the Townhall is Tafelrond, a French styled guild house which was destroyed in World War and was rebuilt again. Ahead of it is University Hall, built in 1317 which was a clothmaker’s hall! From 1432 this has been used by the University. Behind this is the Oude Markt which is famed as the longest bar in the world! Well, it’s not a single bar, but by evening, all the bars in the street have their seating arrangement on the street itself, making it the longest bar in the world!!! After the Town Hall, I headed to the Klein Begijnhof (Small Beguinage) and wrapped up my day with a fantastic live Gregorian music rendition at Keizersberg Abbey. By this time I was dead tired and headed to Stella Artois Brewery (a short walk from here is the railway station) and my guy was there, waiting for me, after enjoying 2 glasses of beer!!! To Leuven: Refer to my earlier post. All these sites are walkable from the Leuven railway station & bus stand. P.S: I was invited by VisitLeuven to experience the city for review purposes, however the opinions are my own and this post does not to advertise the product/service. P.S.2: Stella Artois beer is an alcoholic beverage. You must be of legal drinking age to consume it, as stated by your country. Excessive drinking is injurious to health. Drinking & Driving can be lethal. I agree with you completely. The best way to see a new city is to climb atop something very high and look around. I usually found, too, that churches were the best way to get a great bird's-eye view of the cities. So sad about the library being burned down during WWI! I love the architecture - would be amazing to photograph! The totem sculpture with the jewel beetle is definitely unique. A wonderful list of things to do on a day trip to Leuven. I love the sculptures at the town centre. I am amazed at how much you managed to do in a single day. Hope you treated yourself to a pint as well ;) Cheers!! University Tower Library looks incredible, the views must have been amazing. 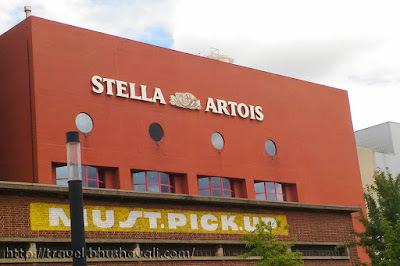 I love Stella, but never knew about the factory in Leuven. Interesting about the park with the walls, who knew! Such a lovely place to visit.. All the architecture of the building is really amazing! Lovely trip you have there! what a cool place Leuven is, i actually never heard of it before. fascinating sculptures there too and such fascinating contributions to food and beer. 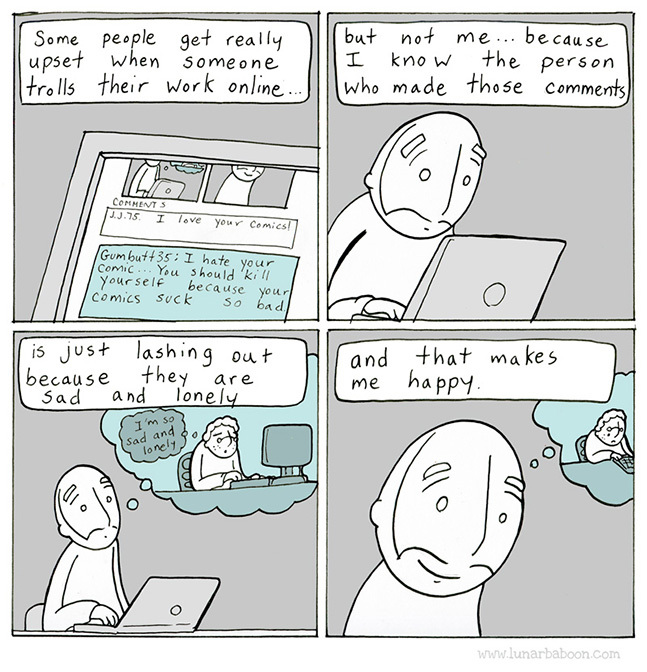 cool post! It must have been tiring climbing the tower whilst being 7 months pregnant! I wouldn't like to be up there when the bell chimes, especially if it's 12 o'clock. You were correct not to do the Stella Artois tour whilst being pregnant. You'll be able to visit all these places again when your girl / boy is born as traveling with kids!! Brussels is boring! This is the answer you will get from people who have travelled around Europe, and surely they didn't check other places near the city. I've never heard of Leuven before and looks like a really nice alternative for the "boring" Brussels. The statues look so cool! I can already imagine how I should pose with each of them for my photo. I have only been to Brussels in Belgium but upon reading this, I feel like I should have opted for Leuven instead! I haven't been here, but I love Belgium because there are so many wonderful opportunities for a beer tour, experience or festival. 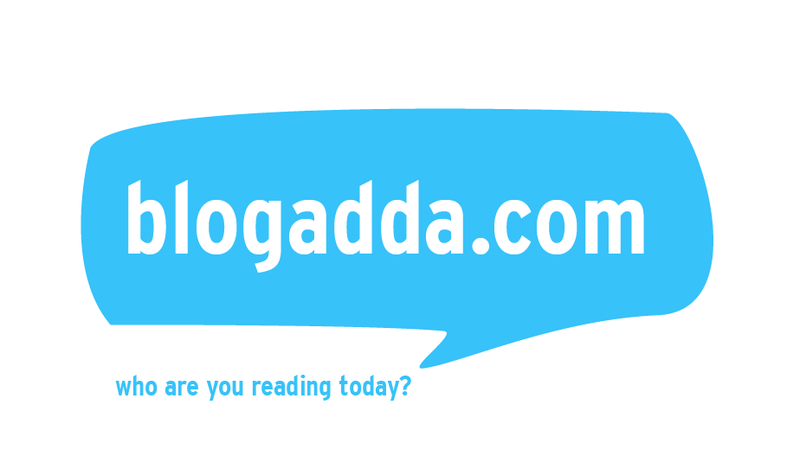 Wow, congratulations for being nominated for the Indiblogger Awards! On other note, your day trip to Leuven seems really meaningful and efficient as there's a lot of places you visited in one go. Leuven looks like a place for heritage and art lovers. Architecture looks stunning. It's so sad that the University library was burnt during the World War. Wish we could have saved those 3 lakh books. The structures look so cool! I can't believe that someone actually stole one of the people from the balloon. I wonder what they did with it? Yes, I agree that getting on top of something really high is one of the best ways to see a place. There seems to be lots to see and do in Leuven. We will definitely keep it in mind. It sounds like you had a great time. I am not sure if I will ever get the chance to see this place Leuven so I thank you for bringing me there. Mix of old and new, like it was in Brussels. I would live to travel to these places, and get to see the things that I only come to know in magazines, online websites, and pages of books from the school days. Wow, even on your 7th month of pregnancy, you're still on the go for this trips. There is a lot of beautiful sites in Belgium. I visited Belgium last year and it was amazing. Flanders was a highlight for me. I love your photos it brings back great memories. Oh its amazing that you've visited the Stella Artois brewery :) I like their beers. I can't help feel amazed with the Totem art. I wonder what is his inspiration. The library looks so gorgeous! I'm so impressed you managed climbing up when you're seven months pregnant! The only place I visited in Belgium was Brussels. It was quite nice but nothing spectacular. I liked however, the beer and the pubs! I'd like to see other villages in Belgium too and Leuven seems so lovely with the colorful architecture. Been to this place. It was a very good experience. I really like seeing preggy travelers. It's like no one can stop you from traveling. It's somehow healthy as long as you're feeling happy which is good for the baby. This is the 5th time I have tried to comment...hopefully it goes through otherwise IDK what to do hahah. I had no idea Stella Artois had originated from there! It would be amazing to go see their brewery since it's one of my favorite beers. I was not too fond of Belgium as a whole, but would love to explore the lesser known cities! Depressing stories are always part of history. But the good thing is that it is now a history. And its nice to look back at it once in a while. Anyway, I'm interested with that Balloon of Friendship. Why is it called such? Anybody? It looks very charming actually, which is why I'm confused that it was never on my radar! Well, it is now, so thanks! Those sculptures are pretty intriguing I must say. Completely agree that the best way to get the views of whole place is by climbing somewhere on the top. Sad to know so many books were burnt away. And Hats off to you girl for roaming around and climbing in the seventh month of your pregnancy. Be safe, take care and keep travelling. Its quite sad that the library got burned down during the world war. But leuven has some really cool scultures and I like sculptures so this looks like my place!